You'll be £10.00 closer to your next £10.00 credit when you purchase Railway Empire. What's this? The British were at the forefront of railway development for the first fifty years of the nineteenth century. 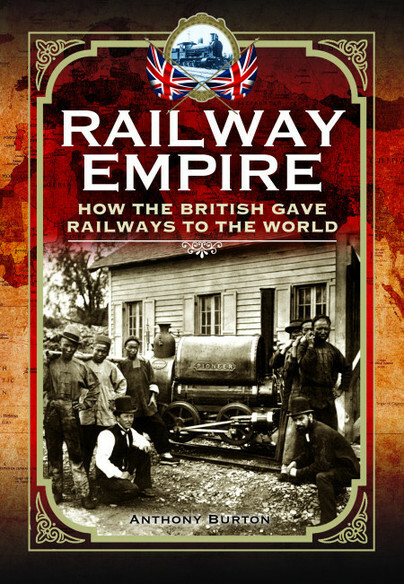 Railway Empire tells the story of how the British gave railways to the world, not only in the empire, but also in other countries outside areas of direct influence. It is often forgotten today that the British were responsible for the construction and management of a large proportion of the railways constructed in Africa, South America and Australasia not to mention many thousands of miles of mileage in Asia, India, Malaya, Burma, China and Japan. This book looks at the political, economic and technical aspects of this development, which made Britain a country at the forefront of this form of transport. The writer tells a fascinating story and the quality of the writing is excellent. The author of this well-presented book is an authoritative historian on industrial heritage, who is also well known from his broadcast work. This experience and knowledge is evident throughout this well researched and detailed account of how Britain exported rail transport to every corner of the Globe. This a remarkable and impressive book which draws on much original material including making extensive use of diary and other accounts from many of the key players at the time. It is supported by an excellent selection of photographs. Anthony Burton has produced a valuable and interesting historical account, I have no hesitation recommending it. With Michael Portillo now travelling around India on their incredible railway system, this book could not be more timely for people interested in the history of world railways. Anthony Burton's examination of how Britain paved the way fr the rest of the world to share in this unique and opportune transport system is fascinating- a reminder of what a great nation we once were. The book is an interesting and in places thought-provoking read on aspects of railway history not previously widely discussed from an overall point of view. There is no doubt that this volume is well written, well researched and eminently readable. Readers interested railways in general, and ‘British’, Imperial’ railways in particular may find it worthy of their attention. It is also possible that Historians researching individual national railway histories may find this volume useful, but with the rider that, because of the inadequacies of the Index, their search could become a fool’s errand. Railway enthusiasts and modellers from many countries may also find the early images of their national railways of interest, again with the proviso that searching for said images may be a major undertaking with no guarantee of success. Readers with only a passing interest in railways, who may be wishing for a simple, undemanding adventure story, may also find this volume worthy of their attention as a ‘Wet Sunday afternoon’ read. Click here to read the full interview article: Stroud-based author maps Britain's railway empire.